KGMU AIDMMChEE 2016 – KGMU had released notification for admission to DM/MCh courses in K.G. Medical University UP, Lucknow, G.S.V.M. Medical College, Kanpur, L.L.R.M. Medical College, Meerut, M.L.N. Medical College, Allahabad and Dr. Ram Manohar Lohia Institute of Medical Sciences, Lucknow for the academic year 2016-2017. For candidates who wish to appear in the exam, read the complete details of KGMU AIDMMChEE 2016 – DM / MCh Entrance Exam 2016 such as application form, eligibility criteria, admit card, result, selection process etc. in this page. The complete detail of KGMU AIDMMChEE 2016 – DM / MCh Entrance Exam 2016 for admission to DM / M.Ch Courses along with application form are given below. KGMU has issued the admit card for those candidate who have successfully filled their application form. Admit card are available on the official website of the KGMU. Candidates are advised to download their admit card from the official website of the KGMU. Direct link to download admit card is also available on this page. Admit Card process is over..!! Candidates who are unable to download their admit card can collect it personally on 09/07/2016 between 10.00 AM to 4.00 PM. from the Pariksha Bhawan, King George Medical University, UP, Lucknow – 226003. Admit cards will not be available after this time. Application Form and Examination Fee shall be submitted online only. Official Bank for submission of Fee is Allahabad Bank and HDFC Bank (Any CBS branch in India or by Master / Visa Card). The candidate must have passed MBBS and passed or appeared in MD/MS/DNB in the relevant subject by 01 July 2016 as given in table below. 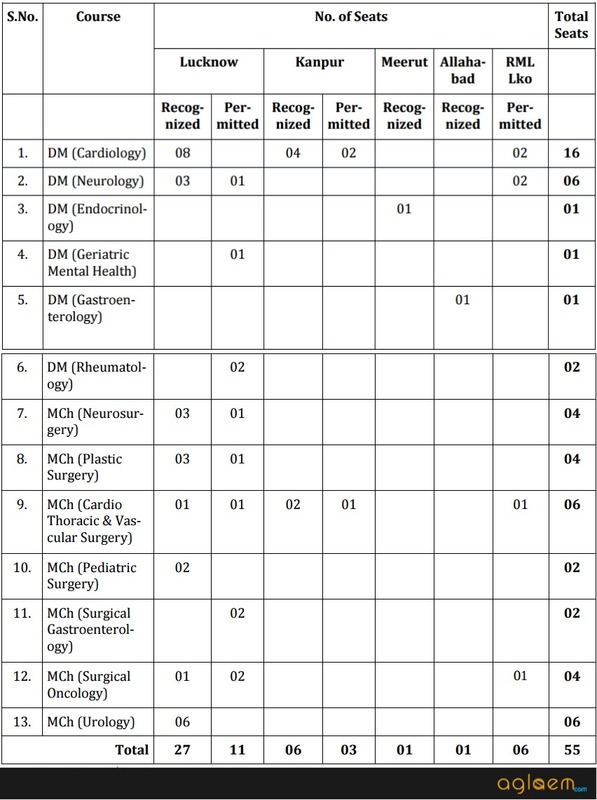 Area of Specialisation Prior Requirement (As per MCI). Those candidates who have appeared in MD/MS/DNB in 2016 shall be eligible only if they produce a passing out certificate at the time of counseling. Candidates can apply for a maximum of 2 courses at a time and give their choice for the Institution. The candidate should satisfy himself/herself of their eligibility before applying. Admission of selected individuals shall be subject to verification of eligibility documents by the appropriate authority. The written examination for all DM/MCh courses shall be held on 10/07/2016. Reporting time for the examination is 9:00 AM. The venue shall be displayed on the admit card. Each candidate shall have 180 Multiple Choice Questions (MCQs) to be answered in 180 minutes and shall include 60 MCQs of General Medicine for all DM courses and 60 MCQs of General Surgery for all MCh courses. The paper may include some questions on statistics and research methodology. The remaining 120 questions shall be of the concerned super-specialty. The examination paper for MCh in Surgical Oncology will include some questions of ENT, Orthopedics and Obstetrics and Gynecology. The MCQs will comprise of four options with “one correct option” and also of“assertion reason” type. The correct response to each question shall be as determined by the Board of Examiners of AIDMMChEE-2016. In case you have any dispute regarding any question, you are required to submit your written specific complaint to the Chief Coordinator within 24 hours of completion of the examination. There shall be four marks for each correct answer. There shall be no negative marking. Candidates applying for two super-specialty subjects shall have to complete the second super-specialty paper of 120 questions separately over one hundred twenty minute time period. There shall be 1 Hours gap between the two papers. Second booklet and OMR sheet will be issued for this purpose. All Candidates will have to appear in first paper to be eligible for counselling. Candidates who only appear for second paper will not be eligible. During Counselling the Merit ranking will be drawn up separately according to the marks of paper I and paper II respectively. There will be no addition of marks of paper I and paper II at all. Admit card of AIDMMChEE-2016 countersigned by the invigilator. A bond of Rs. 1.00 Lac shall be made in favour of the Principal/Director/Registrar/as the case may be. The terms will have to be executed, if the candidate leaves the course before completion. KGMU Result 2018 – Announced!